First, let me say I am honored. 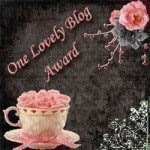 Naqvee at When Almighty Desires presented me with the One Lovely Blog Award. I give you the Faithful Follower Award because that is you! You are always faithful to comment on my posts. You have been following me for quite a while now, as I do you, and I trust you will be there for a long time to come. Your friendship means the world to me. 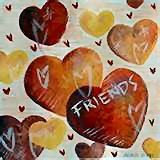 I would also like to present you with the Love My Friends Award. We have commented on each other's blogs for sometime. Over this period of time, I have grown to see you as a very dear friend. I love you, friend, and hope that you have many happy years of sharing your gift of writing with the world. Thank You Lily, whatever you said moved my heart! I just don't know how to wrap simple words of thank you in a golden foil but I m writing some words for you in my post tonight which will be as bright and golden as I mean them to be and they will be just for you! Congratz on winning that award! Lily, congrats on your award. Those are lovely awards you have passed on to Naqvee. Her blog is indeed inspiring. Congratualations on your well deserved award. That was so nice of you to pass on the others. I think awards are a way of taking the time out to spread the love.